Registration is now open for the 2019 Midwest/SW Transit Conference which will be held September 11-13 at the Intercontinental Kansas City at the Plaza in Kansas City, MO. The conference will provide a space for transit professionals, stakeholders, elected and interested citizens across the Midwest to share innovative ideas and best practices with a variety of top presentations, workshops and panel discussions. Exhibitor and sponsor registration is now open. Must be registered early with payment by June 30, 2019 to ensure special arrangements can be made. If registered after June 30, 2019 inclusion on print materials, premium booth assignment, website posting, including items in package or signage cannot be guaranteed. Exhibits Include: 8 X 10 tabletop exhibit includes set-up and tear down of (1) 6 X 30 skirted table, (2) chairs and (1) wastebasket. Vehicle display space will be on a first-come, first-serve basis. Register or Sponsor Now! For MO 5311 providers, a discount code has been set-up. 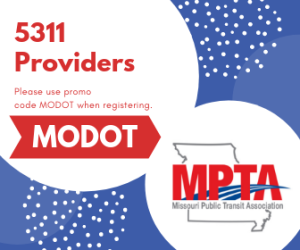 Please use promo code MODOT when registering.